I have been passionate about fiber arts and textiles since I was a child but I am new to felting. 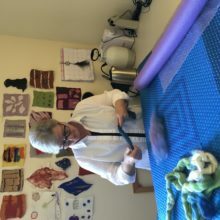 My dedication to learning about felt started a year and a half ago with Fiona Duthie’s “Surface Design” and “Compostion” class, Jean Gauger’s shawelette workshop, Pam DeGroot’s online class and continues on studying the best. This is an education for a new career and I dedicate all of my time to felting, sourcing the best fibers, running an online shop and educating artists in southern Florida about fibers.